Tickets Now On Sale - AND SELLING INCREDIBLY FAST!!! - buy now!!! See you & your friends there! Be sure to "Like" & "Share" above to help spread the word!! 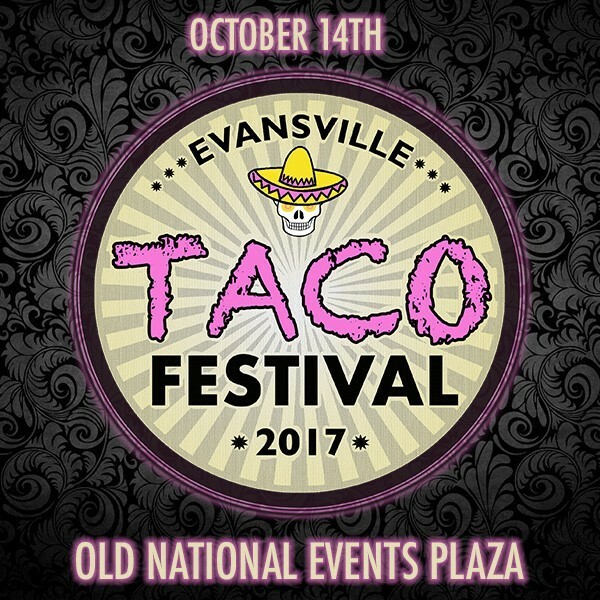 Evansville's 1st Annual Taco Festival is taking place at the Old National Events Plaza on Saturday, October 14, 2017 11am to 7pm! Access to one of the areas best event venues with tons of indoor & outdoor space!!! Going to the Jason Aldean concert? Join us for the Un-Official Jason Aldean Pre-Party & Tailgate Festival!!! Running the half marathon before this festival? Make us your after party destination! At the event, you'll find over 25 of the area's best restaurants, food trucks, and food purveyors dishing out a variety of $3 tacos (sold separately). There will be bars and beverage stations serving margaritas, tequila flights, ice cold beer, water, soda & more. All items will work on a voucher system - there will be various voucher stations throughout the festival & all vouchers will be used as cash. Additional vendors will be on hand to sell other food (cotton candy, cakes, desserts etc) as well. Multiple ATMs will be on site & strongly encourage cash sales at voucher stations. - Children 6 & under are FREE & do not need a ticket. There will be a kids "fun" area as well! Enjoy The Feller Express Trackless Train (children and adults), Mechanical Bull (children and adults), Obstacle (children and adults) and 2 castle bouncy houses suitable for all ages, face painting and children activities. - Have a restaurant, food truck or sponsor inquiry? Please click "contact the organizer" at the top of this page. *All tickets purchased for The Evansville Taco Festival online are final. We Do not issue refunds or exchanges and this is a Rain or Shine Indoor/Outdoor event. Stay The Night - Make it a Weekend! Enjoy the Evansville Taco Festival Responsibly. View More Events Organized by EvansvilleEvents.com. EvansvilleEvents.com is a locally owned website committed to enhancing the events in the Evansville community; a product of Greater Evansville Media LLC. This event is organized by EvansvilleEvents.com.